The approach to dining in the main dining rooms on the Quantum class ships is different than on other cruise ships. Whereas on most cruise ships, there are one or two big main dining rooms, the Quantum class ships have four dining rooms each with a different theme. In addition, on the first Quantum class ship, Quantum of the Seas, Royal Caribbean did away with the traditional two-seating cruise ship dining system in favor of a flexible dining system called “Dynamic Dining,” which promised to allow guests the freedom to dine wherever and whenever they liked. In general, the initial guest reaction to the dining operation on Quantum was not positive. This was due in part to poor communication and technological failures. In addition, a surprising number of guests said that they missed the traditional cruise ship dining system in which they developed friendships with their table companions and waiters over the course of a voyage. Listening to this feedback, Royal Caribbean not only addressed the technological problems but made significant modifications to the main dining room operation on the second Quantum class ship, Anthem of the Seas. We asked Executive Sous Chef Tobias Friendenburg to outline some of these modifications. “The Classic is like the classic dining that we have on the old ships.” Guests who opt for this system choose to dine either at the early seating or the late seat. They dine at the same time with the same table companions and the same waiters each evening. If a guests likes a particular restaurant, he or she does not have to rotate. “I can also go every single night to Chic at my table with the same waiter.”. Each of the four main restaurants on Anthem has its own theme that runs through the décor and the cuisine. 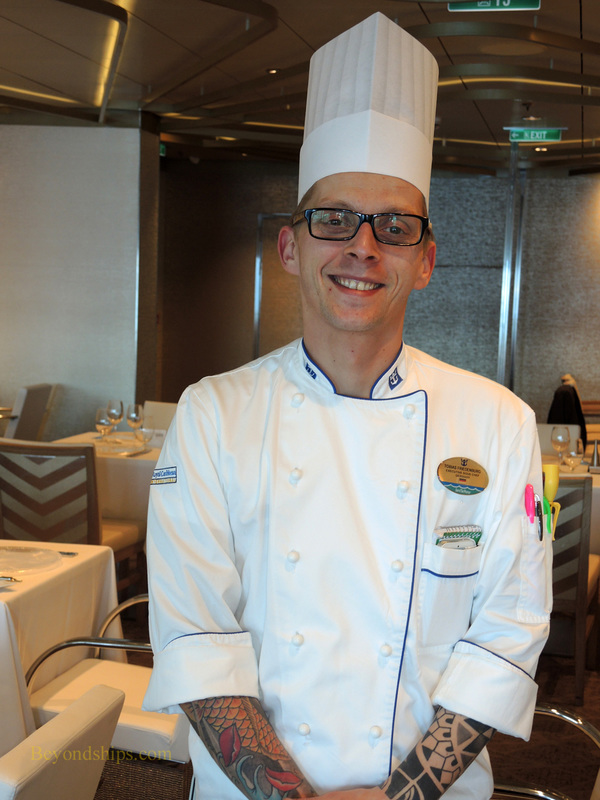 On Quantum of the Seas, while the menu used by each restaurant was different than the menus used in each of the other restaurants, it remained the same throughout the voyage. On Anthem, that is no longer the case. “Basically, we have three different menus.” The first menu combines dishes from each of the restaurants. It is used on the first night of a cruise in all four restaurants in order to give guests an idea of the type of dishes served in each restaurant. “Then you have menu A and menu B” in each restaurant. These menus are unique to a particular restaurant. A restaurant will use either its A or B menu on a given night and then switch to its other menu on another night. Thus, the Grand restaurant may use its Elegance menu one night and use its Opulence menu on another night. Along the same lines, Chic might use its Cosmopolitan menu on one evening and its Metropolitan menu on the next. The idea is to give guests more variety. These changes to the dining operation are in direct response to feedback Royal Caribbean received during the first few months after Quantum entered service. On Anthem, the chefs actively seek guest comments in order to fine tune the operation. *When Anthem entered service, the official name was “Dynamic Dining.” Under that umbrella, you had Dynamic Dining Classic and Dynamic Dining Choice. Dynamic Dining Classic was the traditional style system whereas Dynamic Dining Choice was the flexible system. This nomenclature produced much confusion both among guests and staff. As a result, most people came to call the the traditional system Classic Dining and the flexible system Dynamic Dining.